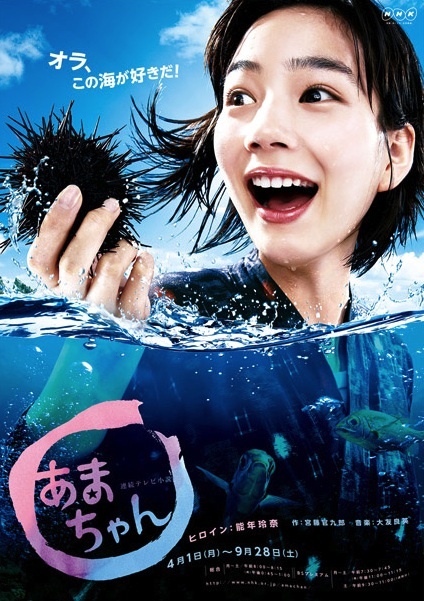 High school student Aki (Rena Nounen) tries to become a female diver in her mother's (Kyoko Koizumi) rural hometown, located in Iwate Prefecture. Aki is influenced by her grandmother Natsu (Nobuko Miyamoto). Kenkyo Dec 26 2017 9:05 am whoaaa, the comments bellow were overflowing with praising!!! i see the number of episodes and Im quite shocked tbh. I never see j dorama having 100 eps before! hmm.. i think i will add this dorama to my watch list after i finish some I have been watching now. Hana Aug 15 2016 8:23 pm Best dorama so far .. I've watched .. I love everything about this drama .. HIGHLY RECOMMENDED ..!!! ArtyStrike Apr 30 2016 5:59 am Best drama ever ! highly recommended . jejewota Nov 02 2015 10:58 am Amazing dorama! Banzai!!! Everyone acted so naturally well. Thumbs up! Aji Abdul Aziz Sep 10 2015 6:57 am Best drama ever, highly recommended!! You're not kidding! Just wanted to watch an episode, then go to sleep. I couldn't resist and had to watch a couple more episodes. Very entertaining. JB Apr 25 2015 11:38 pm Definitley one of my top dramas i've seen till now. Very good story, and very entertaining. The cast is great, and there is never a dull moment. At 15 minutes an episode, i find my self blasting through a whole bunch at a time. Can't stop watching. amachan Apr 06 2015 8:22 am I have seen many dramas up until now and this is by far the best one I've seen. While the story is says it is about aki trying to become an ama, I think it is more about how she affects the people around her, and rena does an amazing job at playing this character. Koizumi Kyoko was probably the best actress I've seen in their entire drama. She really brings rena's character and her own to life in a way that makes you want to watch it more and more. kurokono tasuke Dec 19 2014 8:06 am it mindblowing how the story escalated....very very lovely plot...ultimately totally very very good...u must watch!!! sissy ga pake r Jun 29 2014 6:18 am i like this drama, it's so cool!! magnificent!! my favorite drama!! i like this drama!!! thohir Mar 11 2014 11:27 am @ilernista: I second that!!!! Amanching mania? Mantaaaappp!!!! ilernista Nov 07 2013 3:54 am Manching Mania Mantaaaapp!!! naufaljiro Sep 01 2013 5:40 pm Totally awesome...i love this dorama so much...the best feeling to describe when watched first episode is "love at the first sight"..
i didn't expect this dorama will be this good..
junpei mizocendol Jul 16 2013 9:40 pm Someone please update the cast list, especially ones from the Tokyo (Idol) Arch! Murakami Taka Jun 28 2013 5:31 pm Koizumi Kyoko's performance is outstanding! becca chan. Jun 14 2013 8:24 am im so amaze in that drama!